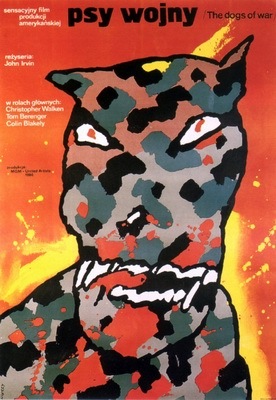 Polish poster, which because of its "oddity" had achieved great international success so rapidly, was original, as we were isolated from the Western world and it did not resemble anything else, as we have seen very little and have been completely on our own. A good poster is always an interpretation. A picture tells us something, while a poster is as a road sign, must be clear and convey the very core of things. I once designed a poster for "Operation Arsenal". There is a symbol of Polish resistance made of a composition of Polish scouts' crosses. The message is very simple, but it is also very clear. A composition brought to the absolute minimum in its faded form and colours, despite using well-known symbols, is free from banality. For instance the poster for Janusz Kidawa's "Ultimatum" employs two colours, black and white, and presents a white, reversed stool, without one leg, and three other ones ending with men heads in masks. The symbol relates to the film, which tells a history of four assassins, planning to attack the Polish Embassy in Brno. Eventually their plan fails as their bombs turn to be imitations and, in the conclusive moment, one of the men decides to remain faithful to his political cause and deploys a hand grenade. The poster is therefore a riddle becoming understandable only after we have seen the film. This sensation of the Polish Film Poster can be called an ‘international phenomenon.’ These posters make their own stories, take viewers to their own, unique world. They often constitute an interesting brain-teaser, bring a smile. This allows them to be standalone works independent of the relevant films. They are fully valuable works of art on their own. Thus, we would like to invite you to familiarise yourselves with this particularly interesting phenomenon during more than a dozen exhibitions of Polish Film Poster, which will be held during the Polish film festival Play Poland 2014 in 10 cities in the United Kingdom, Norwey, Canada and the United States of America.